Successfully Added USB Printer and Device Server to your Shopping Cart. 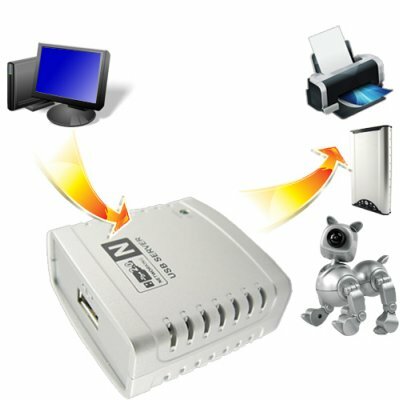 USB Printer and Device Server for sharing printers, hard drives, scanners or other USB devices. Wouldn't it be nice if you didn't have to plug your printer into a computer just to share it? Isn't there a more convenient way to share entire hard drives or other USB devices on your network? When will humans stop working for machines and start making them work for us? Give your home or small office network the convenience and accessibility it deserves with this USB print and device server! With this USB print and device server, you can share one multifunction printer, hard-drive, webcam or other USB device on your wired or wireless network. Print, scan, or fax with one multi-function printer from any computer on your network. Share a hard drive to quickly and easily access files and media. Let users on your network check the feed from a webcam as a simple, effective security system. Is setting up your network bringing you down? Don't worry, this USB print and device server couldn't be easier to use. Just pop in the software, plug the USB server into your wired or wireless router, and connect your USB device. That's it! You can now access your shared USB devices just as if they were attached to your computer. You can even password protect individual devices for security. Don't forget to check out our huge selection of USB devices to use with this USB server. This hot new product is in stock now for single piece or stock orders. Order it today and start being more productive tomorrow! Supported Devices: Use this USB server to share an external hard drive, hard drive enclosure, flash disk, memory pens, memory card reader, USB webcam, USB speaker, USB Multi-Function Printer, USB scanner, USB Gamepad, USB phone, USB external CD/DVD reader/recorder and more. This USB print server has 1 USB port and supports only one USB device at a time. Any shared device can be used by one user at a time. Buy several USB print servers to share multiple USB devices in different locations. Chinavasion's factory-direct prices let you save more when you buy more! ONE. Even if you use a USB hub, the USB print and device server will only recognize the first device you plug in. Yes. Just plug the USB print and device server into your wireless hub, and you can access it through your network. This CD that comes with this USB printer and device server has two different software, which one should I use? For best results, use the software called "Networking USB Server." This lets you connect to a shared printer quickly and easily. Gives a lot of opportunities, whereas otherwise networkequipement like hdd's, or networkprinters would cost much more then this product. It is VERY handy for trying out different stuff, almost anything that has a usb connectors can be connected. Hopefully (and let it be come true) there will a multiport usb server available...??? 5 stars to customer support. Impossible to get such support even from manufacturer. It works well as described. Still lot more tweaking can be done. I am using it to connect my USB to printserver and connect to wireless network. Now, I have the freedom to access the USB (Hard disk) without connecting directly to my system. 5 stars to customer service and 5 star to product.